Riverbit Registry Cleaner is a highly reliable tool to clean up unnecessary registry entries in your registry. Backup function makes Riverbit Registry Cleaner safe and convenient. It allows you to easily recover any changes if required. 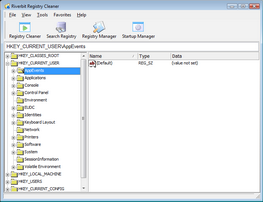 Registry editor provided by Riverbit Registry Cleaner also lets you manually choose registry entries to be fixed. Included handy Startup Manager adds to the list of Riverbit Registry Cleaner advantages. ...... and easier to run and, what is most important, better integrated with Windows. Unfortunately, Windows registry has a weak point. With time, your computer registry may start gathering corrupted, unused, and unnecessary registry keys, especially if keys are not removed when you uninstall a program. Usually, when you uninstall software, it is highly probable that without a good program to fix certain registry issues, you'll be left with the seeds of future registry trouble. As a result the registry will start taking more space than it really needs and the efficiency of its usage will become really low. Qweas is providing links to Riverbit Registry Cleaner 2.0 as a courtesy, and makes no representations regarding Riverbit Registry Cleaner or any other applications or any information related thereto. Any questions, complaints or claims regarding this application Riverbit Registry Cleaner 2.0 must be directed to the appropriate software vendor. You may click the publisher link of Riverbit Registry Cleaner on the top of this page to get more details about the vendor.